With all of this talk about monetizing your blog and using your blog to generate business, and hence, generate an income, how POUR is your blog? Fresh from SOBCon09: Biz School for Bloggers in Chicago, my awesome presentation is now available as an ebook! links for 2009-05-14 | Ip's. Glenda, your presentation today rocked so many worlds. You brought home the reality of how easy it is to have an accessible site and why it is so important. The why is most critical for us to understand. You’ve changed the conversation here at #sobcon09. Thank you!!! 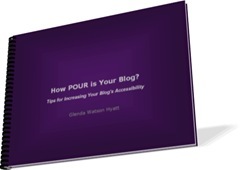 Glenda I learned a lot from your presentation and this ebook rocks! Thank you for being inspirational and informative! Glenda – connecting with you live was such a treat for me. Your authenticity and passion shines through so clearly to all who encounter you. This ebook is going to help ALL of us become more intelligent information sharers. The way your ebook reminds us of the importance of just adding little things that we can easily do makes this one everyone should read! Thanks everyone for positive feedback from my SOBCon presentation. I’m glad (and relieved) that you enjoyed it and found it informative. However, that was only the tip of the iceberg! Bigger things are in the works… Meanwhile, let me know if you have any questions about making your blog more accessible. I’ve downloaded the PDF and skim read it, and looks like good practical tips for blog accessibility so thanks for that. I have also tweeted it. It was an amazing book, and all of us bloggers surely learnt a lot from your ideas. I am sure it will go a long way spreading the word on usability. 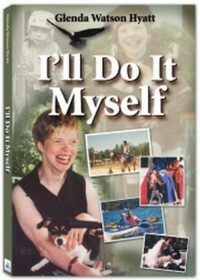 Glenda, i haven’t blog yet, but i found your book I’ll do it myself excellent! Thanks for your kind words, Dominika! Have you considered blogging? Let us know if you have any questions in getting started?